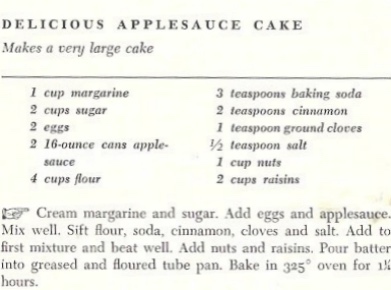 A Taste of History with Joyce White: Mrs. Tawes' "Delicious Applesauce Cake"
Mrs. Tawes' "Delicious Applesauce Cake"
This recipe is taken from My Favorite Maryland Recipes published in 1964 and written by Helen Avalynne Tawes, also known as Mrs. J. Millard Tawes, a former first lady of Maryland, from 1959-1967. Mrs. Tawes was fascinated with Maryland's rich food traditions and experimented with modernizing vintage recipes for the mid-20th century kitchen. According to Mrs. Tawes, writing in the 1960s, Marylanders are "aware that we have inherited some traditions that make our lives distinctively agreeable. One of these is our Maryland foods." 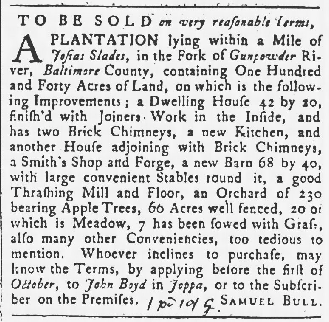 According to Mrs. Tawes, another agreeable aspect of living in Maryland is enjoying the distinct pleasure of living along the Chesapeake Bay. Mrs. Tawes' first compilation of recipes was created while her husband was on the gubernatorial campaign trail. It was a cookbook that contained just twenty-two recipes and was just about food, not politics. However, it was touted as a "piece of campaign literature" that, according to friends, was very helpful in winning the office of governor for her husband. Apples, from the Rosaceae family in the genus of Malus, originated in Asia Minor. According to The Oxford Encyclopedia of Food and Drink in America, Second Edition (Andrew Smith, ed., 2013), apples made their way to Europe and then to North America with the colonists. 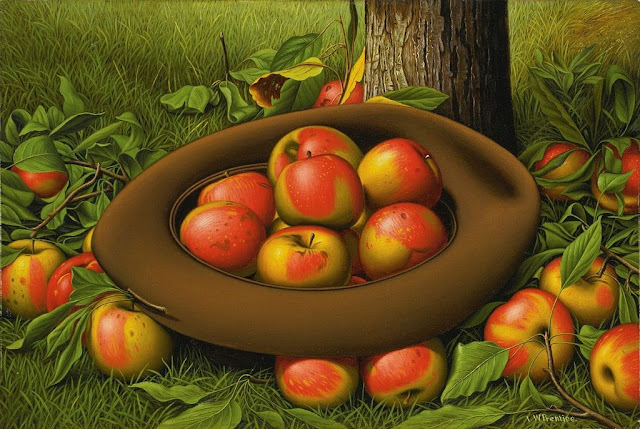 By the middle of the 17th century, apples were being cultivate in North America mainly for their use in the production of cider, that alcoholic beverage that has become so fashionable once again in America, particularly in Maryland. By 1820, apple cider was the national beverage and vast orchards dotted the landscape. When a tree would produce a fruit with a quality that lent itself to good eating, grafting and experimentations ensued. By about 1850, this resulted in thousands of apple varieties available that were suitable for many different culinary and feasting purposes. This, by no means, implies that apples were only used for cider prior to the 19th century (as numerous recipes can attest); rather, this was simply when a great commercial boom occurred in the "eating apple" market. Maryland has a long history of growing apples to produce cider apples and fantastic tasting eating apples. A simple google search can direct you to the numerous farms and orchards specializing in the crop. Maryland growers offer pick-your-own apples and a variety of products such as apple cider donuts, applesauce, apple butter, pies, cakes, sweet cider, and delicious and potent hard apple cider.